After retiring as Sevilla goalkeeper in 1999, the next year he was hired as the club's new sporting director following relegation to the second tier. Little did the Sevilla hierarchy at the time know what Monchi's work would go on to achieve, as they swiftly won promotion back to LaLiga and embarked on the most successful period in the club's history. 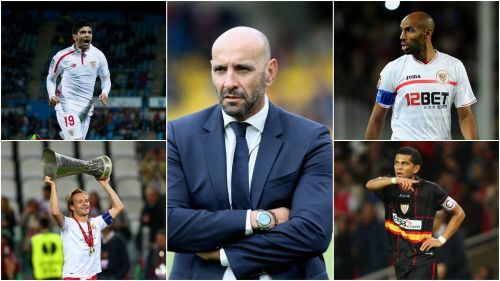 During Monchi's 17 years in charge, Sevilla won the second division, five Europa League/UEFA Cup titles, the Spanish Supercopa, UEFA Super Cup and two Copa del Rey crowns. Key to Sevilla's success was Monchi's knack of signing players on the cheap and selling for a significant profit, something he will be hoping to resume when he takes office on April 1. Surely Monchi's crowning achievement. In 2002, Alves was plucked from the obscurity of Bahia while still a teenager, initially joining on loan before signing permanently for a reported €550,000 fee. The attacking full-back formed a fine partnership on the right with Jesus Navas and played a crucial role in back-to-back UEFA Cup wins. He joined Barcelona in an apparent €41.5m deal in 2008, winning every title possible in one the greatest eras in the club's history. He has gone on to become one of the most decorated players to ever play the game. A little like with Kanoute, Monchi brought Rakitic to Sevilla when he appeared to be struggling to live up to his early promise. He paid Schalke just €2.5m for the Croatian in January 2011 and the midfielder enjoyed an excellent first few months. His first full season showed why doubts about him had arisen in Germany, as he failed to score a single goal in LaLiga, but Unai Emery's arrival in the 2012-13 campaign saw his fortunes transform. The following season Rakitic inspired Europa League success, earning his €18m move to Barcelona, where he continues to be a key player. The early years of Banega's career were mired by scandals and fitness problems, sometimes combining the two like when he managed to run himself over with his own car. When he first joined Sevilla in 2014, there was an air of 'now or never' for the gifted Argentina international, costing just €2.5m as Valencia reportedly just wanted rid of him. After a slow start he became one of the first names on the team sheet, playing arguably the best football of his career and winning two Europa League titles. He left for Inter in 2016, but returned a year later, with Monchi counting him as one of his best buys. It all got a bit ugly when Vitolo moved from Sevilla to Atletico Madrid in 2017, as he was alleged to have verbally agreed to a contract extension which would have seen his release clause increase to €50m just before Diego Simeone's side triggered his previous €37.5m buy-out figure. However, prior to that and the subsequent legal battle, the winger had four successful seasons in Andalusia, his powerful running and work-rate fitting perfectly into Emery's counter-attacking style. He was instrumental in the three successive Europa League triumphs and, considering he only cost €3m in the first place, Vitolo is a classic Monchi signing. Castro (on Vitolo): "There is a written agreement, the club will do whatever is necessary"